For Valentines Day, Emily said she would make me some brownies. That’s about all I need in life, really. Well, and a cup of milk. But what she ended up making–shown here fresh out of the oven–was not just a brownie. 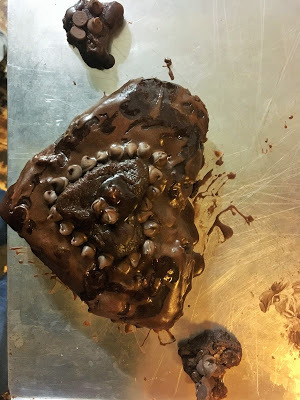 It was a three layer heart shaped brownie, with chocolate frosting between each layer, and chocolate chips on top. And a couple of leftover heart brownie hearts on the side. (Or maybe they were kidneys?) It was quite possibly the single best Valentines Day treat I ever got in my life. My wife truly knows the way to my heart. But what the heck. If I’m going to keel over, I’m going by chocolate. Mark R Hunter is the author of three romantic comedies: Radio Red, Storm Chaser, and its sequel, The Notorious Ian Grant, as well as a related story collection, Storm Chaser Shorts. He also wrote a young adult adventure, The No-Campfire Girls, and a humor collection, Slightly Off the Mark. In addition, he collaborated with his wife, Emily, on the history books Images of America: Albion and Noble County, Smoky Days and Sleepless Nights: A Century or So With The Albion Fire Department, and Hoosier Hysterical. Mark’s work also appeared in the anthologies My Funny Valentine and Strange Portals: Ink Slingers’ Fantasy/Horror Anthology. For two decades Mark R Hunter has been an emergency dispatcher for the Noble County Sheriff Department. He’s served over 32 years as a volunteer for the Albion Fire Department, holding such positions as safety officer, training officer, secretary, and public information officer. He also has done public relations writing for the Noble County Relay For Life, among other organizations, and served two terms on the Albion Town Council. When asked if he has any free time, he laughs hysterically. Mark lives in Albion, Indiana, with his wife and editor Emily, a cowardly ball python named Lucius, and a loving, scary dog named Beowulf. He has two daughters and twin grandsons, and so naturally is considering writing a children’s book. You might have to bring your own ingredients!